Higher student fees will be among the options raised today at a major conference on the "growing crisis" of funding of third-level education in Ireland. University leaders say there is a need for "urgent action" on a new funding regime for higher education and today marks the start of a concerted campaign by them on the issue. The Irish Universities Association (IUA) has brought in international experts to review the challenges facing third-level in Ireland - particularly who should foot the rising bill. It will hear of the pressures on higher education in Ireland, that funding can no longer depend on State investment, and that there must be a greater contribution from private sources. One private source is the fee paid by students, which currently stands at €2,750 annually, although there could also be more investment from industry and philanthropic donations. An argument used to support higher fees is the financial rewards of holding a degree and, in many other countries, students pay more through a loan system, repaying the cost after they graduate. Among those addressing the conference is Education Minister Jan O'Sullivan, providing an opportunity for her to outline, for the first time, her thoughts on a particularly thorny issue for a Labour minister, because of the potential implications for hard-pressed families. Universities and other colleges are struggling financially arising from growing student numbers coupled with a decline in State funding. The funding constraints are being blamed for the decline in the standing of Irish universities in international rankings. Since 2008, there has been a 33pc decrease in Exchequer support to meet colleges' day-to-day costs - down from €1.39bn to €938.9m. Over the same period, the total income per student received by colleges dropped by 22pc, and the student to staff ratio is 19:1, compared with an average 14:1 across the rest of the developed world. There has been virtually no new State investment in buildings/facilities since 2008, and 40pc of the system's infrastructure is now below standard, according to a report by Higher Education Authority (HEA). 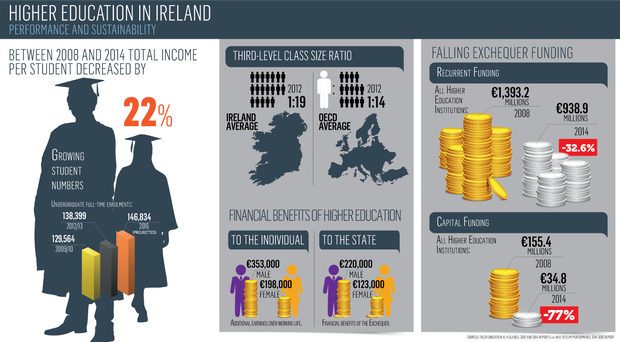 Former education minister Ruairi Quinn introduced a regime that has increased the student contribution by €250 a year since 2011. After the final phase, next September, the charge will be €3,000. The big question is what happens after that. With a new government due to be voted in by Spring 2016, at the latest, the funding of higher-level education, including the consequences for the student contribution, will be a major issue in the run-up to the election. One of today's speakers, US education public policy adviser Art Hauptman believes the sustainability of Irish higher education "cannot be accomplished by maintaining existing policies that place almost total dependence on the public sector to fund rapidly growing demand for higher education". He argues that the biggest issues facing higher education is not the level of national investment, but the mix of public and private funding. "The key for achieving sustainable policies is for Ireland to increase its level of private investment while maintaining public investment levels. He says this could be done in several ways that don't require "extraordinary sacrifice from parents and students". He suggests a broad reconsideration of the fee and student support schemes, that would rely on private funds. According to Professor Stephanie Fahey of accountancy giant, Ernst and Young, Australia, while there is a recognition of the need for Irish universities to be globally competitive, "it is less clear to an external observer how this will be funded and how this can be delivered in an environment where student numbers and staff:student ratios are both on the rise." IUA chief executive Ned Costello will tell the symposium that the pressures on higher education are not unique to Ireland, but he highlights "the scale of the challenge facing us and the need for urgent action. As national recovery begins to take hold, there is too much at stake to jeopardise our future through complacency or prevarication."